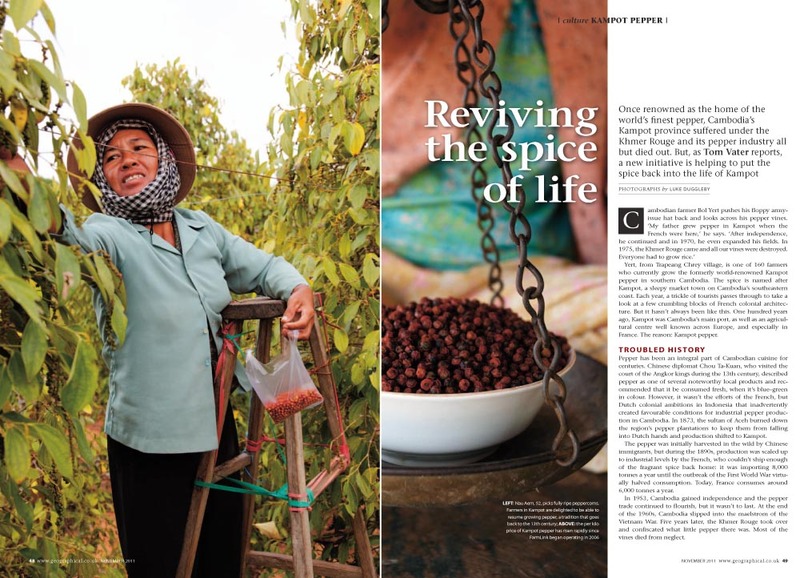 Published in November’s issue of Geographical Magazine, magazine of the Royal Geographical Society, was Bangkok based photographer’s Luke Duggleby‘s feature on the reviving of Cambodia’s pepper industry after it was destroyed by the Khmer Rouge. I traveled to Kampot with Luke to write the story. One of Cambodia’s best known exports prior to the Khmer Rouge revolution was pepper, grown for the most part around Kampot, an idyllic French-era seaside town on the kingdom’s south eastern coast. Chou Ta-Kuan, the Chinese envoy who visited Cambodia in the 13th century made mention of pepper in his book The Customs of Cambodia as part of a list of remarkable Cambodian products. He recommended pepper to be consumed when it’s fresh and blue-green in color. Major production started in the late 19th century and was soon exported all over the world. In France, Kampot Pepper soon became a household name. By 1900, production had reached 8,000 tons a year. In 1960, there were more than a million pepper poles in Kampot Province. 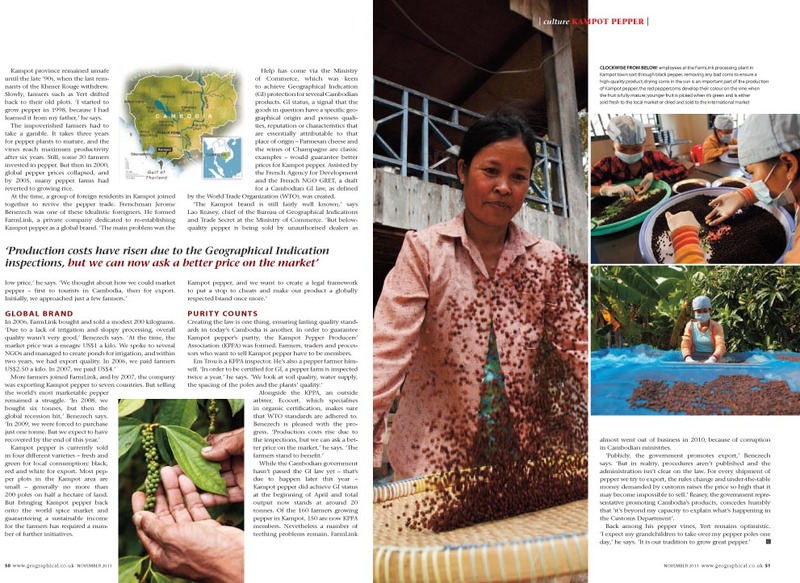 The Khmer Rouge put an end to this, but some surviving farmers returned to their fields in the 1980s, following Vietnamese liberation, and some have begun to grow pepper again. Because most small-scale farmers live more or less from hand to mouth, the pepper vine, which needs to mature for three years before it starts producing any harvestable pepper corns, has been slow to return. And yet, the plant is a good long-term investment. It reaches full maturity after six years and can be harvested for as long as fifteen years. Several hundred farmers are now working with NGOs and foreign investors to rebuild the industry. In Kampot Province, pepper is grown just once a year and harvested between September and April, depending on the type of pepper. The region produces fresh green pepper, black pepper, white pepper and red pepper. Sometimes it’s possible to purchase bird pepper, which, as the name suggests, has been digested and expelled by birds. Bird pepper is said to have aphrodisiac powers.